Suppose, for a moment, that you are in a strange town on a business trip. Suppose that, in the eerie twilight, you are walking back to your generic motel room after having consumed a forgettable meal served by a forgettable franchise restaurant, along a busy commercial thoroughfare with telephone wires overhead. 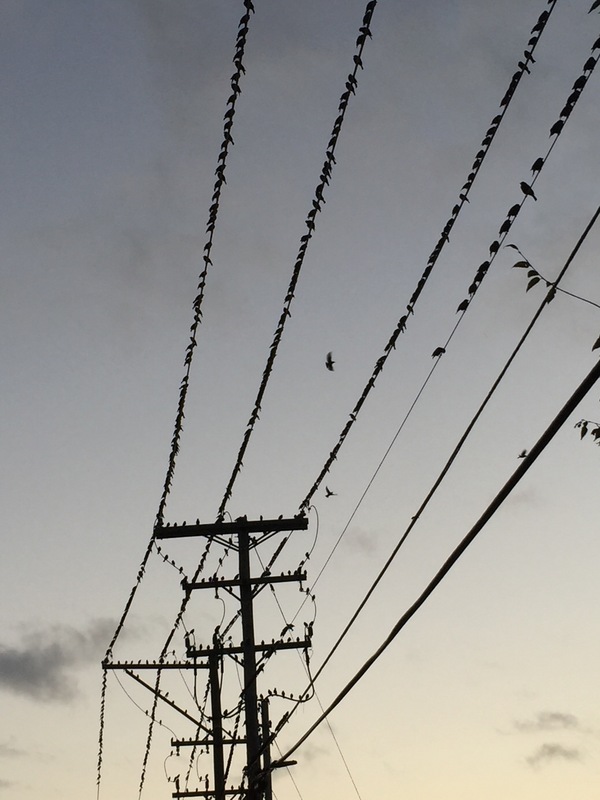 Suppose you hear an odd fluttering noise, like a random displacement of air, when suddenly you look up and see that every square inch of telephone pole and wire is covered by a roiling mass of indistinguishable black birds that don’t seem to be doing anything except creepily perching in this spot for reasons known only to their tiny, alien, nictating bird brains. Oh, yeah — and suppose when you were a kid you stupidly watched Alfred Hitchcock’s The Birds on late-night TV and ever since you’ve been secretly terrified by the possibility that your eyes will be pecked out by evil birds in a strange town — probably after you have to put up with tiresome lectures by some bird know-it-all woman wearing a beret. Yes, you’ll sleep well tonight, experiencing the wonders of business travel. At least you haven’t seen anybody in a beret . . . yet. 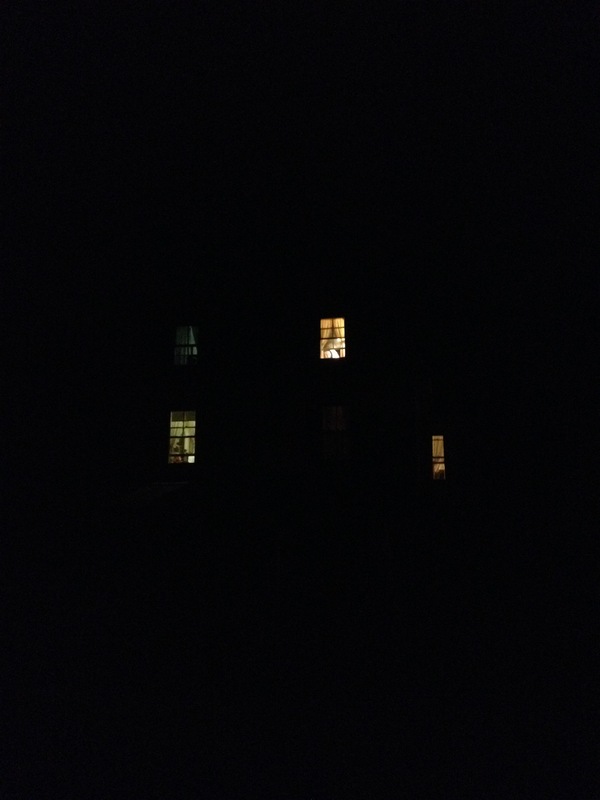 When you’re staying in a strange, rural area, and you pass an old, gabled farmhouse, and happen to look up and see the unmoving outline of a woman backlit against a third-floor window, what thought comes to mind? Psycho, of course! Even though there’s no Bates Motel sign to be seen, you’re subconsciously scanning the landscape for a knife-wielding Anthony Perkins clad in an old-fashioned full-length dress. No steaming hot shower is ever completely comfortable when you are in the immediate vicinity of such a scene, is it? And that slashing, stabbing Psycho soundtrack music helpfully starts playing in the back of your mind to add to the creepiness factor, too. l’m sure there’s a perfectly good reason why a woman would be up in the third floor of a house, framed against the window. Maybe it’s her favorite place to watch TV, or maybe that precise spot is where cell phone reception is inexplicably the strongest. Or maybe it’s just a rotting, maggot-infested corpse kept there by a deeply disturbed murderer with a Mommy complex. There’s a new TV show that’s being advertised constantly. Call me a wuss if you will, but I can’t bring myself to watch it. It’s Bates Motel — the back story, apparently, of Norman Bates and his mother, Norma. Of course, Norman figured prominently in the Hitchcock thriller Psycho, where he donned his mother’s dress and ruthlessly stabbed to death a young woman taking a shower in the motel that Norman managed. I think Psycho is one of the creepiest, most unsettling movies ever made, and Norman Bates is one of the creepiest, most unsettling movie characters ever conceived. In view of that, why in the world would I want to see even more of young Norm and his unbalanced mother? Is there really a big audience for a TV that tells their disturbing story? Of course, if Bates Motel is successful it might start a trend. Why stop at telling the bloody tale of only one horror movie icon? No doubt other TV producers will begin searching for frightening film characters whose earlier days remain unexplored. Some possibilities: Little White, the moving, coming-of-age tale of an awkward young shark striving to become an unstoppable killing machine off the beaches of Amity in New England; Hockey Boy, the whimsical tale of Jason Voorhees, an uncoordinated youngster whose dreams of career in the NHL are foiled but who discovers he experiences strange new urges when he dons a hockey mask; and Vlad Ain’t Bad, a comedy about a white-skinned, cape-wearing exchange student from eastern Europe who fits right in with the Goth crowd then discovers an insatiable craving for corpuscles. The yellow-bellied birds of Cocobay are hungry . . . always hungry. When people leave their tables after a meal, a scout bird quickly flits down for a look. If the plate looks promising — not a typical scenario, because the food here is excellent and clean plates are the rule — the word goes out on the bird grapevine. Suddenly another bird appears, then another, then another. Before you know it, there’s a storm of bright yellow birds nibbling at every plate, crumb, and ice cream bowl on the abandoned table, with wings beating furiously as they fly back and forth after retrieving a scrap and scarfing it down. They eat as much as they can before a server comes over to clear the table and shoo them away. With the sudden appearance of dozens of previously undetected birds, their rapid, decisive movements, and their creepy narrowing bird eyes as they turn their gaze at your inviting table, it’s a scene that might make someone like Alfred Hitchcock get an idea about making a movie about aggressive, flocking birds that have a newfound taste for a different kind of food item. What makes for a good Halloween scare? For me, it’s the more subtle, deliciously creepy stuff that is most thrilling. I’m not much for over-the-top gore or slasher films. Buckets of blood spraying everywhere as a masked guy who can’t be killed eviscerates a bunch of horny teenagers may be startling, but ultimately is boring. I’d rather watch a Hitchcock movie than any of the Friday the 13th series. Old-fashioned horror films, where character development occurs and back stories are told, are better than the recent movies that devote all of their creative energies toward figuring out new ways to behead, impale, or disembowel the indestructible killer or his hapless victims. Good scary movies are always suspenseful, but don’t need to be gory. The best ones have a weird, interesting character — and sometimes more than one. Usually they involve a twist or two, and a false start or other surprise. Consider Silence of the Lambs. It’s really not a very bloody movie, but I’d wager that most people felt a deep, horrible, mounting anxiety and terror as FBI agent Clarice Starling closed in on the profoundly disturbed Buffalo Bill in that ancient, darkened basement. In my view, that scenario — and Clarice’s spine-tingling interactions with Dr. Hannibal Lecter — are scarier than Jason anyday. If, like me, you are a big fan of Alfred Hitchcock’s work, you are excited about the announcement that a long-lost piece of the master’s work has been found. The apparent new addition to the Hitchcock library is part of The White Shadow, a silent film released in 1923. Hitchcock was the writer, assistant director, editor, and production designer for the movie which, like many silent films, was made using unstable, highly flammable material. No one had heard of or seen the movie in years, and many people thought it was lost forever. It turns out that part of the movie was squirreled away in a vault in the New Zealand Film Archive, improperly labeled, and was found by an American researcher. The find has thrilled film historians, who are eager to see whether the reels of The White Shadow show any of the flourishes that made Hitchcock movies so distinctive. The newly discovered work will be screened in Hollywood in September. No doubt it will be a hot ticket. Filmgoers have endlessly analyzed the merits of Hitchcock’s films, his techniques, and his extraordinary ability to convey and then build suspense without resorting to cheap shocks. He was a groundbreaking talent, and watching his first real work in film will help people understand how that enormous talent developed.